This ceramic glass GE cooktop offers a smooth and seamless cooktop surface that makes cleaning quick and easy, and two ribbon, 6-inch heating elements. With ribbon heating elements, the heat comes from brightly glowing elements positioned beneath the smooth surface. Even heat is directed straight up to the pan for high speed heat-up. It also offers a 9/12-inch heating element with PowerBoil that accommodates various sizes of pots or pans and speeds the boiling process. The GE Built-In Radiant Cooktop features a six-inch ribbon heating element as well as a six-inch/nine-inch ribbon dual heating element for total cooking versatility. Other special features include a glass ceramic cooktop that makes cleaning up a snap, easily accessible controls and a hot surface indicator light so that you and your family keep safe while cooking your favourite foods. Enjoy meal preparation with this 24-inch Haier electric cooktop. Its smooth ceramic glass surface is easy to clean, and the dual left-front element lets you heat large and small pots and pans effectively. Metal control knobs provide fuss-free burner adjustment, and this GE electric cooktop has a hot-surface indicator light for safety. Profile 36- Inch Electric Cooktop in Black This ceramic glass GE cooktop offers a smooth and seamless cooktop surface that makes cleaning quick and easy, and two ribbon, 6-inch heating elements. With ribbon heating elements, the heat comes from brightly glowing elements positioned beneath the smooth surface. Even heat is directed straight up to the pan for high speed heat-up. It also offers a 9/12-inch heating element with PowerBoil that accommodates various sizes of pots or pans and speeds the boiling process. 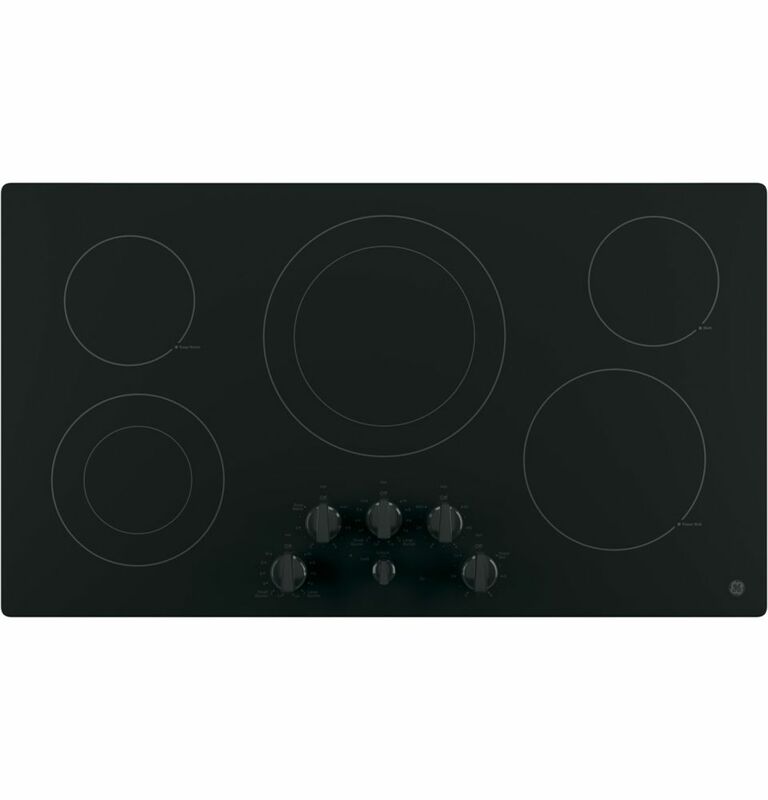 Profile 36- Inch Electric Cooktop in Black is rated 4.3 out of 5 by 82. Rated 5 out of 5 by LoriG from Love my cooktop...it was a replacement and I am very... Love my cooktop...it was a replacement and I am very happy with the updates made by GE. Rated 4 out of 5 by Lib from Love the look. Hard to clean around knobs. ... Love the look. Hard to clean around knobs. Otherwise meets the need. Rated 1 out of 5 by Alfa from Turns itself off in the middle of cooking. It turns itself off in the middle of cooking and the burners are inconsistent. Had repairs done three times in the past six months. Very bad. Rated 5 out of 5 by SD sailor from Excellent product This cooktop fits my needs perfectly: It's extremely quick to heat up, has the features I want, and is easy to clean and attractive as well. Rated 4 out of 5 by Kittie from Great! Very user friendly. Great! Very user friendly. Rated 5 out of 5 by Satiro from Just purchased the stove , happy with the performance as of this date. Just purchased the stove , happy with the performance as of this date. Rated 5 out of 5 by amb1 from Great Features I have cooked a lot of food on this stove the next day it was installed and it seems like the food cooks faster than my last stove. Easier to clean and maintain.